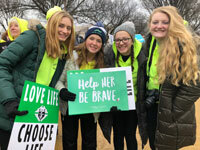 Abortion providers argue that second and third trimester abortions are only allowed when a mother's life and health are in danger. What they don't tell you is that according to Doe vs. Bolton, health is defined in very broad terms i.e., social well-being, as to make it virtually impossible for a state to protect the unborn child even after the sixth or seventh month of pregnancy. 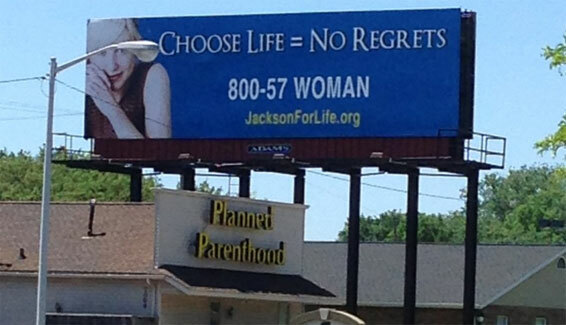 renting billboard space next to the Jackson Planned Parenthood. The billboard was on Planned Parenthood’s property. Adams Outdoor Advertising had leased the billboard space but forgotten about Planned Parenthood’s addendum forbidding any pro-life messaging. So just as quickly as the billboard went up, on June 9, it came down the next day. Adams is offering Jackson RTL other locations, and on the advice of attorneys Jackson RTL is accepting Adams’ offer and moving on. But the snafu was all worth it for the amazing photo op, eh?